This week’s winner came to us from @702Web for a New Years Eve picture of the Las Vegas and Tropicana Blvd intersection. 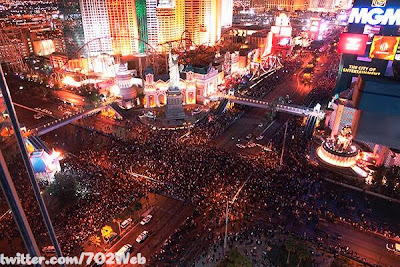 New Years is the one time of year when traffic is shut down on the Strip and people are allowed to spill into the streets. We are told via our friends at Access Vegas that this intersection is definitely the best place to view the fireworks. The photo is taken on top of Tropicana looking down at the mobbed intersection. 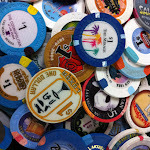 You can see the masses spilling into the streets via all four properties at that location, Excalibur, NYNY, MGM and Trop. What I particularly like about this photo is that it not only shows a unique view of the strip but it looks almost apocalyptic. Like Vegas ran out of alcohol and riots ensued. In fact, there are many captious you put to this picture. One thing that can’t be debated is that this is a cool picture from a unique vantage point.